Obituary for Thomas Roy Slater | Frederick Funeral Home, Inc.
Thomas Roy Slater completed his Earthly Journey to receive his reward in Heaven on Monday, September 10, 2018, in Danbury Connecticut. He was 96 years of age. He was born in Homestead Park, PA to Thomas and Annie Bessie (Snyder) Slater on September 25, 1921. 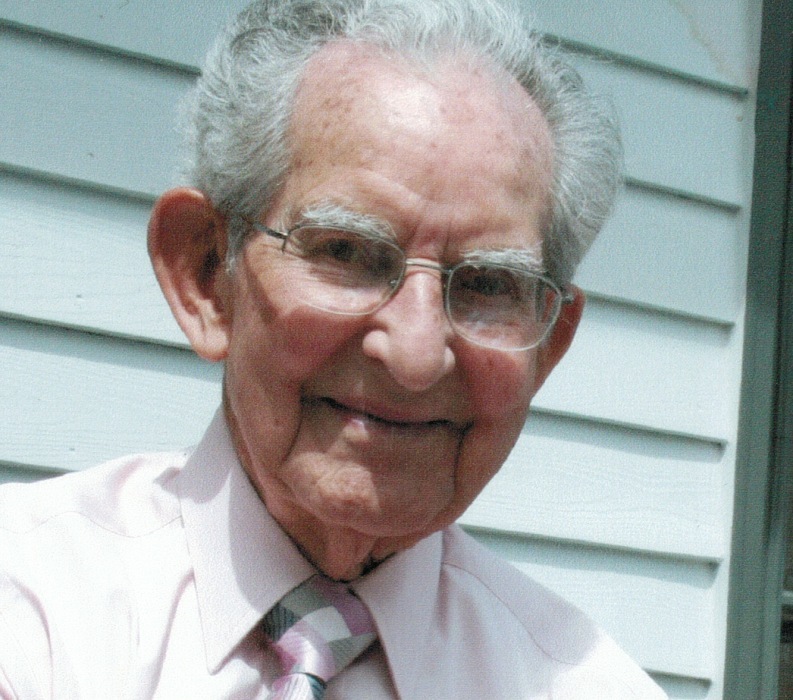 As a Munhall High School graduate, Class of 1939, Thomas distinguished himself as the class president and member of the National Honor Society. During World War II (1942-1945), he was stationed at Hethel Airbase near Norwich, England, where he ran the Link Trainer Department. Upon returning home, he began dating and later married his beloved Ethel Mae Matthews, who, after 69 years of marriage, preceded him in death in March of 2016. Tom and Ethel made their home in Latrobe for the last fifty years where they both were active members in the city they loved. He retired as VP of Estimating from L-D Building Company/ Dill Construction Company in 1984 where he worked for over 20 years. In his retirement years, Tom enjoyed golf and was an avid walker. Tom’s welcoming smile and wave to all, always amazed his grandchildren, as they thought he knew everyone in town! (and he almost did) As a strong man of faith, Tom had a passion for giving generously of his time to the church and community. He was a member of the Latrobe Presbyterian Church. During his years in Latrobe, he served on the Boards of The Salvation Army, The Water Authority, The Union Mission, The Youth Commission, was a Lay Leader in the United Methodist Church and was active in Meals on Wheels and Kiwanis International to name a few. Tom remained a member of Gideons International. His kindness, honesty, and willingness to help others was always at the center of his life. Beloved husband, father, grandfather, great-grandfather, and friend to all. He is survived by his loving daughter Pamela and her husband Kenneth Kelly of Monroe, CT, their three children, Ryan and his wife Kristina and their beautiful daughters Annabelle, Emeline, and Adelyn of Monroe, CT, Sarah and her husband Rory Waltzer of Venice, CA, and Thomas and his wife Christina of Fairfield, CT, and many loved nieces and nephews. His time in Connecticut was spent surrounded by his grandchildren and great-granddaughters, which brought him much happiness and joy. Preceded in death by his parents, Thomas, and Bessie Slater, brothers, John (Maude) and William (Anna) Slater, sisters, Hester (Earl) Wiechelt and Evelyn (David) Asson. Visitation will be on Friday, October 26, 2018, at the Frederick Funeral Home Inc., 1543 Ligonier Street, Latrobe, PA from 6:00 – 8:00 p.m. A Memorial service will be held at 11:00 a.m., Saturday, October 27, 2018, at the Latrobe Presbyterian Church, Latrobe, PA with Reverend Clark R. Kerr officiating. All are welcome to join the family in honoring Thomas Roy Slater’s life. Private interment will take place following the service in Unity Cemetery, Latrobe, PA. Military Honors will be rendered at the graveside. In lieu of flowers, the family requests that donations be made to the Juvenile Diabetes Research Foundation (JDRF) or the Latrobe Presbyterian Church in his name. Frederick Funeral Home, Inc., Latrobe, PA entrusted with arrangements. To purchase flowers or send condolences, please visit www.FrederickFuneralHome.com.